Peter Zimonjic · CBC News · Posted November 7, 2018. FOR SPEECHES BY PRIME MINISTER TRUDEAU AND THE LEADERS OF THE CONSERVATIVE, NEW DEMOCRATS, and GREENS Click here. The Nazi regime of Adolf Hitler tested the limits of Canada’s humanity in the lead up to the Second World War and Canada’s government failed that test “miserably,” Prime Minister Justin Trudeau said today. “In the years leading up to the war, Hitler tested the world’s resolve. He noted carefully as country after country proved itself indifferent to the plight of Jewish refugees,” Trudeau said. “He watched on as we refused their visas, ignored their letters and denied them entry. With every decree, he challenged the political courage of our leaders and the empathy of those who elected them. “The story of the St. Louis and its passengers is no isolated incident,” Trudeau added. 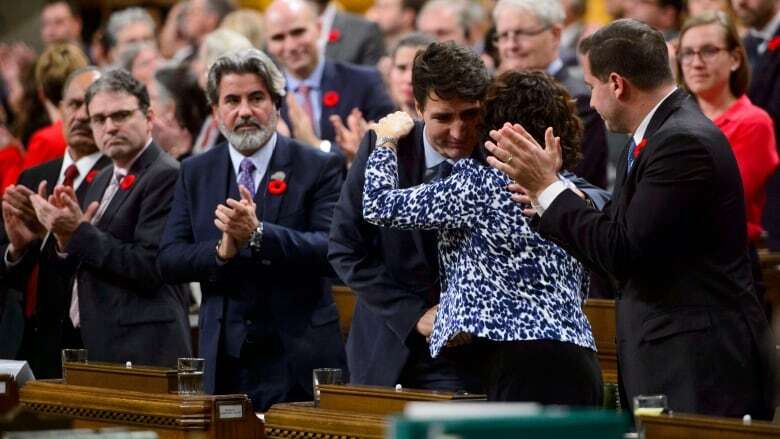 “Today, I rise in this House of Commons to issue a long overdue apology to the Jewish refugees Canada turned away,” Trudeau said. “We apologize to the 907 German Jews aboard the MS. St-Louis, as well as their families. We also apologize to others who paid the price of our inaction, whom we doomed to the ultimate horror of the death camps. Trudeau also apologized for letting anti-Semitism take root in Canada and for the way Canadians Jews were “meant to feel like strangers in their own homes, aliens in their own land. “Discrimination and violence against Jewish people in Canada and around the world continues at an alarming rate,” he said. Conservative Leader Andrew Scheer taking part in the Canadian government’s official apology for the 1939 decision to turn away the MS St. Louis and its 907 German Jewish passengers fleeing the Nazi Regime. 10:43. “It is a sign of a healthy society to be able to look at history clearly and see both the light and the dark, to celebrate our achievements but to also mourn our failings,” Conservative Leader Andrew Scheer said. “Two hundred and fifty four people who had boarded the MS St. Louis in the hopes of fleeing death … could have been saved had Canada said, `Yes,” `said NDP leader in the House of Commons Guy Caron. “Canada abandoned people who then became victims to Hitler and his hate. “The passengers of the MS St. Louis were fleeing anti-Semitism, unaware that anti-Semitism had crossed the ocean before them. The Bloc Quebecois’ Mario Beaulieu also stood in the House to deliver comments in French before Green Party Leader Elizabeth May closed out the apology with her own statement. May said all Canadians bear the “stain of this crime.” She noted that we would not understand it as well as we do without the work of historians Irving Abella and Harold Troper, who wrote the book None is Too Many about Canada’s anti-Semitic policies during the Second World War and the plight of the MS St. Louis.